The SECURITEX Carpark Counter Management System is designed to track the number of vehicle passing through the Carpark entrance barrier and tally with the vehicle leaving the exit barrier. This system will also have a “CARPARK FULL” High brightness LED signage to inform the driver when the Carpark is full. Upon detection of the Carpark full, the built-in relay will activate and disable the entrance barrier. The built-in comparator will than compare the Entrance and Exit count again unit once it detect the Carpark have available space the counter relay will deactivate and enable the barrier to open for the next vehicle. 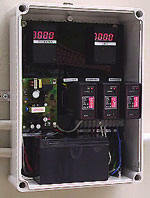 The above “Model CCMS-1C” system is made up of 1 unit high quality digital counter that can count up to 9999. The high-efficiency red 5-digits 7 segments LED display used is highly visible even in bright sunlight area. The intelligent function built-in allow the counter add and minus the number of vehicle enter and exit the Carpark. When the counter reached its preset number of Carpark space available, the FULL sign will appear and the built-in relay will activate and disable the barrier system. Furthermore in situation where the power supply system malfunction, the counter is able to retain the last count before the power outage. This ensures the last count is not lost until counter is manually reset. The above version has a power back-up unit that can even continuously provide power to the counter and the “Nortech” detector to allow counting to continue even after the power outage. To further enhance the accuracy of the “CCMS-1C” counter, we have put in a “Nortech” PD134 loop detector sensor for this counter. This detector sensitivity can be preset for various situation. •1 unit 12 V 7.0Ah rechargeable battery, Input required: 115/230 VAC Battery Data: McNair 12 Volt @ 7.0 AH sealed rechargeable lead-acid battery.